ICTBroadcast handles all the complexities of a large scalable system in the back-end and hides all the complexities from the users and administrators. As a user of the system, administrators and users don't have to worry about anything in the back-end. You just have to create your campaign and start dialing your contact group. ICTBroadcast uses Open source Asterisk PBX as its back-end. ICTBroadcast service provider edition can be scaled to multiple nodes of Asterisk PBX. So this also eliminates the bottleneck of single Asterisk PBX server. 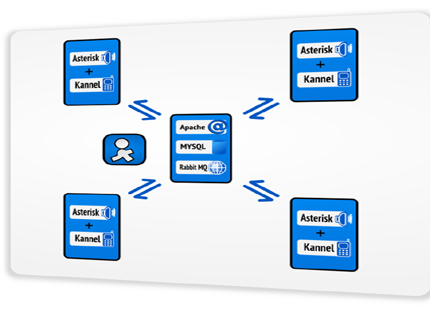 Now multiple Asterisk node can be communicated transparently without any delay. Moreover, administrators don't have to worry about the back-end. Easy to use monitoring system of ICTBroadcast gives you real-time statistics of the servers machines and call load.